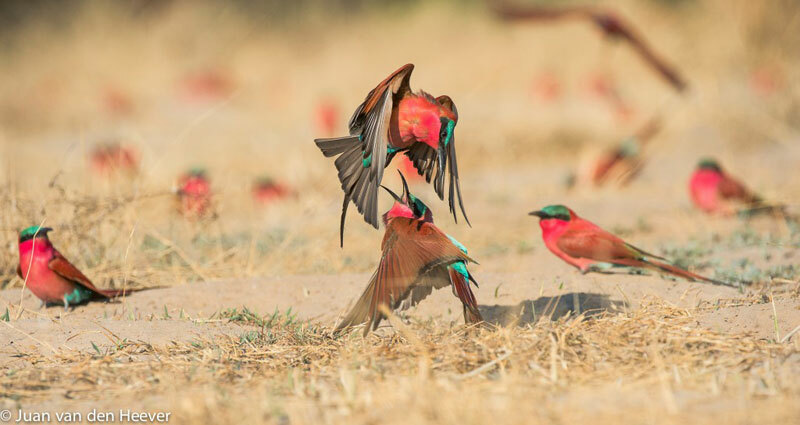 Every year, on exactly 22 August up to five thousand Southern Carmine Bee-Eaters, Merops nubicoides, converge to the banks of the mighty Zambezi River in northern Namibia to breed, feed and raise the next generation. Along with them, avid photographers flock to this immense gathering to photograph them throughout their breeding cycle. These dogfights are few and far between and don’t last all that long so having the correct equipment and setup is of the utmost importance. 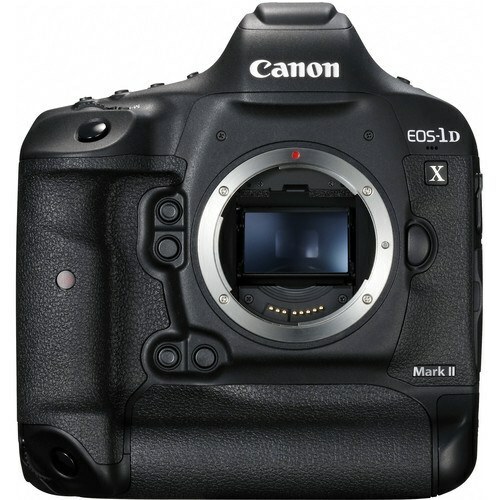 Body: Nikon D3s, Nikon D4 or Nikon D4s or any other high performance body. 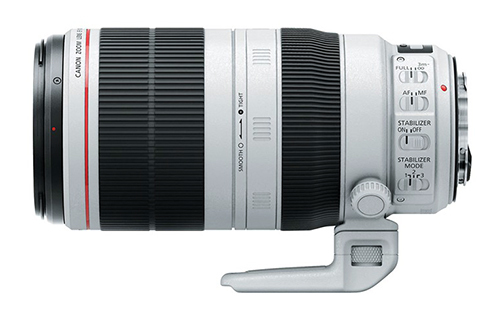 My most likely equipment combination would be a Nikon D4, Nikon 24-70mm f2.8 and Nikon 200-400mm f/4. 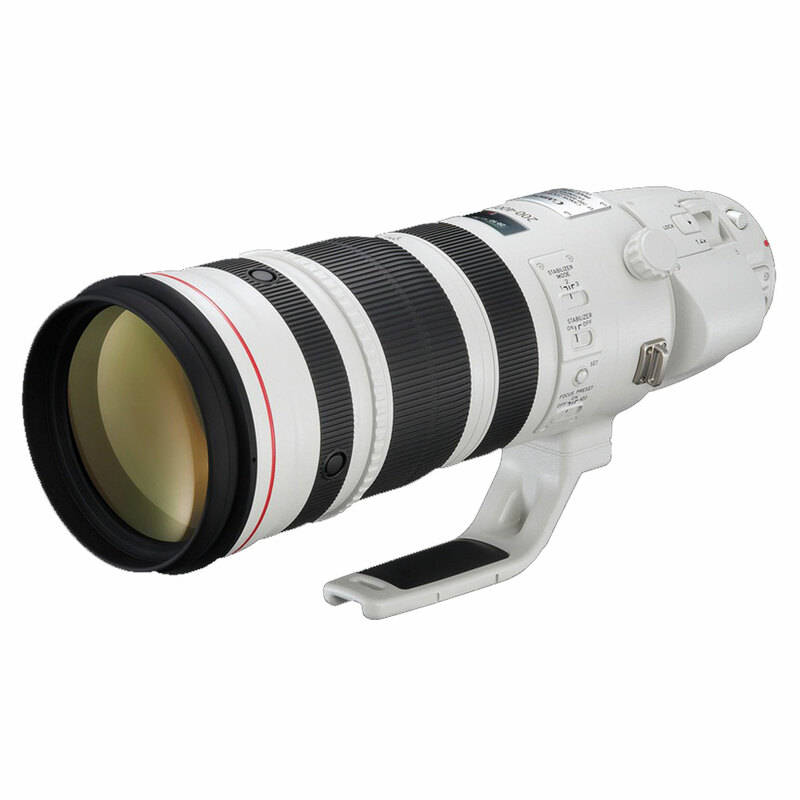 As I do not yet have the resources to buy my own camera kit (which could fetch over R300 000). I make use of the wonderful ODP Rentals department. 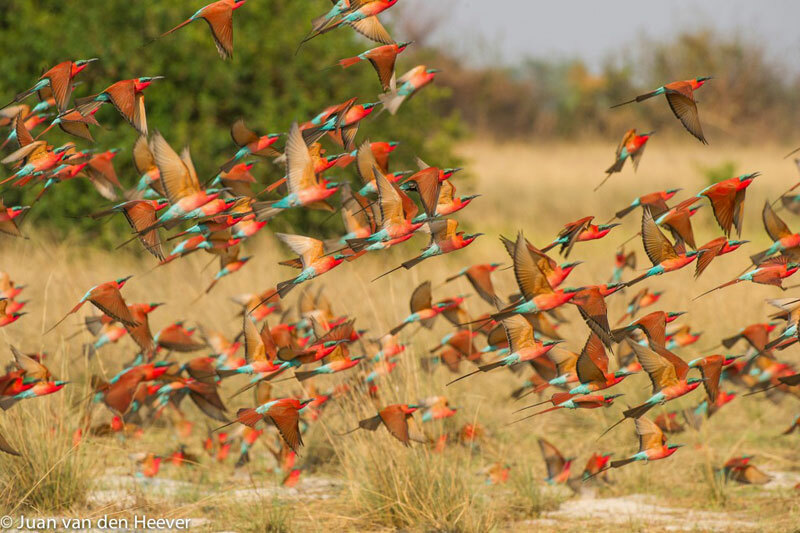 One and a half kilometers from the 4-star Kalizo Lodge, about 35km out of Katima Mulilo is the Zambezi River floodplain. These sandy patches are where all the nests are dug and where most of the image possibilities are. Several times a day, particularly in the late evenings, individuals head to the close-by river to bathe. This, if close enough, could give you wonderful images of splashing water. I would recommend a lens with a long reach, as they could plunge quite far away from the shore. A hide or camouflaged outfit could help you to get close-up images of these usually skittish birds. While digging their nest, a large amount of adults stay on the ground. 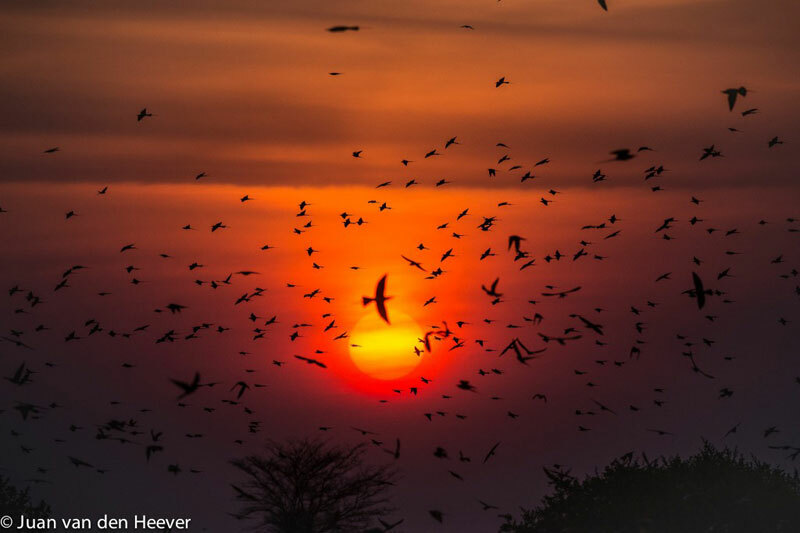 When predators like Yellow-Billed Kites (Milvus parasitus) or Tawny Eagles (Aquila rapax) fly over, or come too close to the nesting area, the whole colony takes off, usually in unison or in the same direction, creating beautifully synchronised patterns. A wider angle like a 200mm would be ideal. The setting sun, combined with the constantly flying Carmines could produce amazing landscape opportunities. When using large and heavy lenses,making use of a tripod or monopod with a gimbal head to assist with stabilization in low light situations and prevent muscle fatigue when using the heavy gear for extended periods of time. My name is Juan van den Heever. I was born in Nelspruit on the 9th of December 1999. 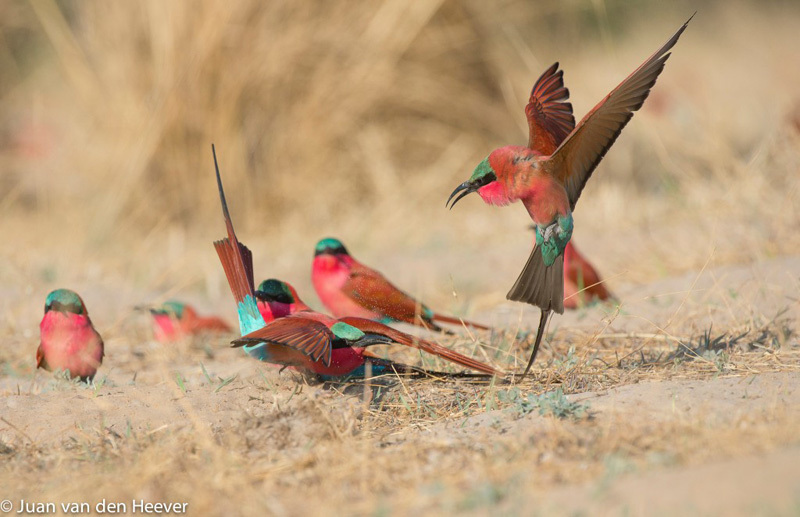 After moving to Johannesburg in 2000 my father, Wim van den Heever, became a full-time photographer. I received my first camera on my 6th birthday and was commonly seen clicking away at scenes around the house of whatever I found interesting. On a family vacation in 2008 to Knysna and Wilderness I fell in love with photography. From then I have accompanied my father on many of his safaris. I used my first professional kit on a safari to the Masai Mara in 2011. 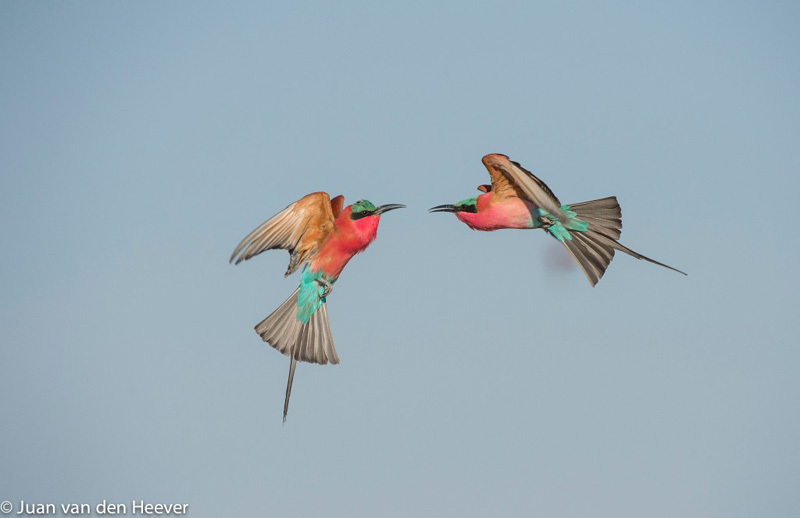 In 2012 and 2013, after entering the Nature's Best Windland Smith Rice Photographic competition, I received a "highly honoured" certification in the Youth Photographer of the Year category. In 2014 I was awarded the overall grand title winner in the Youth category of this competition. In 2015 I received the overall winner and first runner-up in the "Youth 13-18 years" category in the Nature's Best Africa Competition. It is so amazing to see and read about a young professional photographer. Keep it up, you have a bright future ahead of you. From an old man who can only dream of taking pictures like yours.